Down with the old, up with the new. The Fort Dodge Fire Department now has an illuminated marker befitting of 2018. 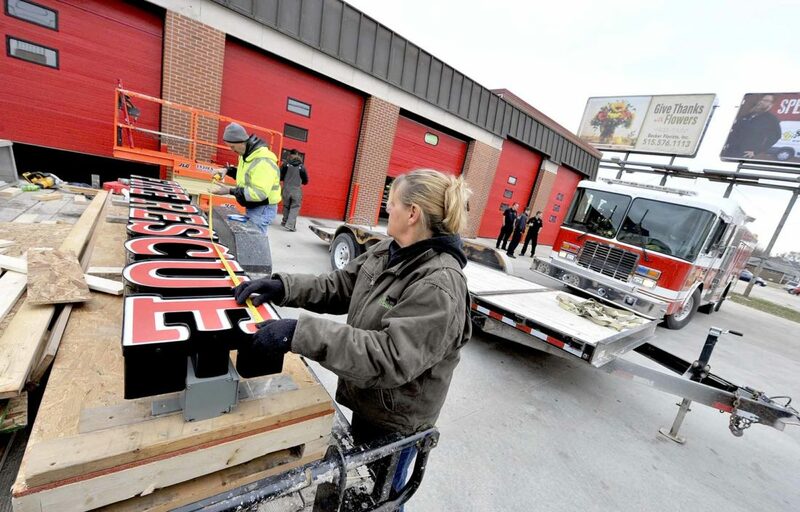 -Messenger photo by Hans Madsen Mid Iowa Sign co-owner Tim Ruebel, at left, along with employee Gary Beekman, right, test fit the logo portion of the new illuminated signs they installed Thursday at the Fort Dodge Fire Department station. Mid Iowa Sign owners Tim and Peggy Ruebel along with employee Gary Beekman take their last trip down on the scissor lift Thursday afternoon as they work installing the new illuminated signs at the Fort Dodge Fire Department station. -Messenger photo by Hans Madsen Fort Dodge firefighter Chuck DeBaun carries a portion of the old sign into the station Thursday afternoon after a crew from Mid Iowa Sign installed the new illuminated signs at the station. The department put the old signs in storage till they decide what to do with them. Mid Iowa Sign owners Tim Ruebel and Peggy Ruebel mesure out the Fire Rescue portion of the new illuminated signs they installed Thursday at the Fort Dodge Fire Department station as a crew of firefighters return from a medical call. 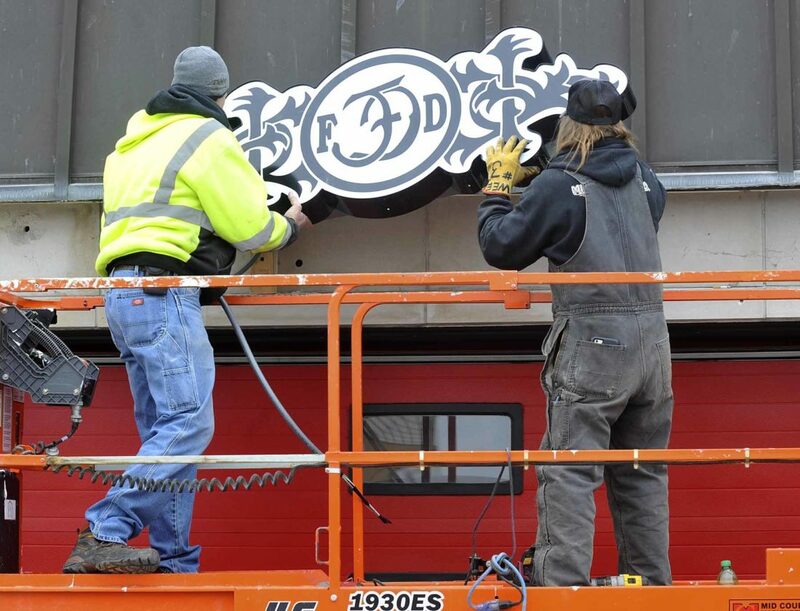 The members of the Fort Dodge Fire Department got a souvenir of sorts Thursday after the crew from Mid Iowa Sign finished putting up the new LED illuminated signs at the fire station downtown. That memento is the old sign that had been on the side of the building since it was constructed. It was coated with 53 years of streaked grime and no longer lit up. Fort Dodge Fire Chief Steve Hergenreter is happy to see it down. 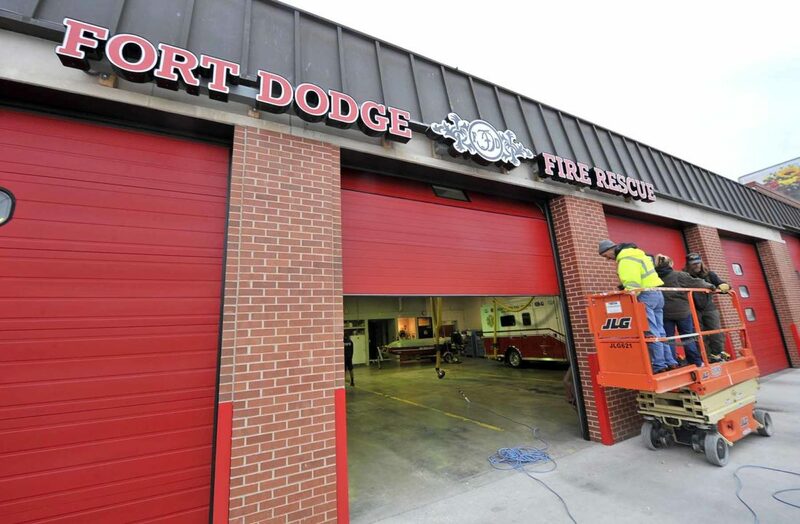 The new signs are a result of the Fort Dodge Fire Rescue Image Project. 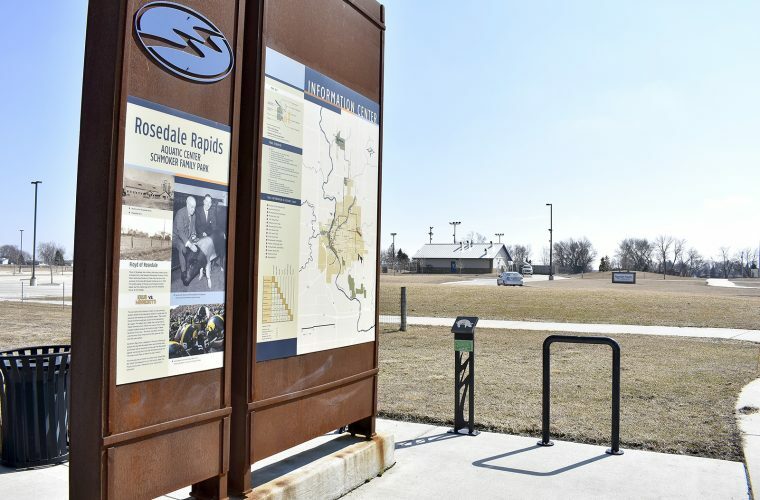 An effort was started in the spring of 2017 by the Greater Fort Dodge Growth Alliance’s Image Committee to improve what was then the faded and dated facade of the station. The LED illuminated signs will complement the repainted west-facing station doors. That was part of the project as well. They’re now the traditional fire station door red. The signage features bright red “Fort Dodge” and “Fire Rescue.” Between the two groups of words, another sign showcases the department’s logo that matches the logo on the department’s trucks. The final cost of the project is $10,558, according to the Image Committee. Fundraising began in December 2017 and raised $6,832. Those donations were combined with a grant from Casey’s General Store, a paint donation from the Fort Dodge Sherwin Williams, a $1,500 donation from Citizens Credit Union and funds from the fire department. Image Committee member Rhonda Chambers compared the project to another successful project that members of the community joined together on. With the fire station located at the busy intersection of Central Avenue and 15th Street, the project is highly visible. 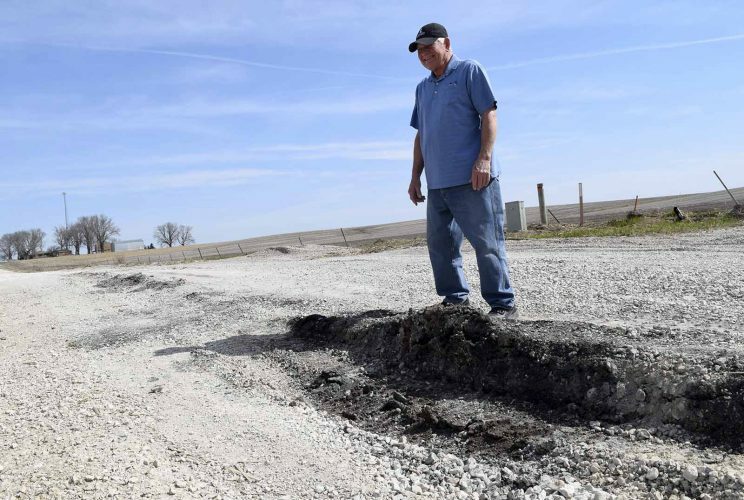 “This improvement makes a positive impact for not only the citizens of the community, but also to the great men and women who work in the Fort Dodge Fire Rescue station,” Chambers said. Phil Gunderson, a member of the Growth Alliance’s Keep 15th Clean and Green Committee, agrees. The firefighters will have to wait one more day to see the sign lit up, though. Hergenreter said Bemrich Electric is expected Friday to hook up the wiring. He’s pretty excited about that moment. “I’m going to be like the dad in ‘Christmas Story’ with the lamp in the window,” he said. Hergenreter said that since it is a part of the department’s history, they plan on keeping the old sign. Where, how and in what manner they might display it, is a decision for later. For now, though, they put it in a storage room.